We have recently had a repaint done to Chandos Hall. The two pictures below show before and after. 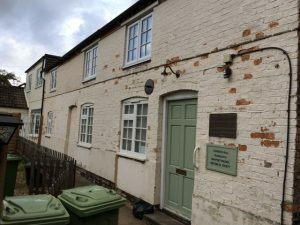 The Newport Pagnell Historical Society has its headquarters and museum at Chandos Hall in Silver Street, Newport Pagnell. 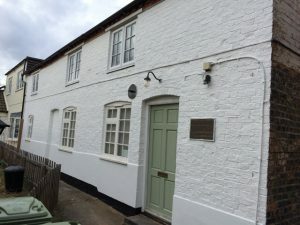 Chandos Hall is an historic building in the town, because until 1994 it was owned by The Oddfellows Society and was used by their society as a branch meeting lodge for their members. The Oddfellows Society is 200 years old and is steeped in history. As a result the Historical Society is highly honoured to own such an iconic building in Newport Pagnell’s history. On this site there is a detailed account of the acquisition of Chandos Hall and also of the history of The Oddfellows Society. The Historical Society has in trust items relating to the Oddfellows and they can be seen when visiting the Museum. This picture is one of several related to the Oddfellows Society, this link below will take you to more information. Keep using the back arrow to return.